A little over a month ago, President Trump signed the Tax Cuts and Jobs Act into law, and Americans are already feeling better than ever about the state of our economy. In a recent poll from Quinnipiac University, 66 percent of Americans rated the nation’s economy as either “excellent” or “good”—a three percentage point jump since last month. It’s difficult to not be excited about the impact the tax bill is having on Arizona and its small businesses. The relief could not have come sooner. Arizona is home to nearly 500,000 small businesses that employ approximately one million people. For too long these entities have struggled under a burdensome tax code that has prevented growth. With the previous federal tax rate approaching 40 percent, small businesses saw much of their hard-earned revenue disappear into the pockets of Uncle Sam. Fortunately, measures included in the new tax relief package will reduce this burden. The Tax Cuts and Jobs Act created a 20 percent standard deduction that applies to roughly 95 percent of small businesses and eliminates high tax brackets in favor of new, lower ones. To put the standard deduction in layman’s terms, with the help of the new tax legislation, small businesses earning $200,000 a year are able to shield their first $40,000 of income from taxation. That extra cash can now be funneled into employee bonuses, wage increases, job creation, and business expansion. These measures will further bolster Arizona’s pro-business, pro-growth reputation. According to a report by BMO Financial Group, Arizona’s business environment is already strong. While most state economies are expected to grow by an average of 2.2 percent, Arizona anticipates 2.8 percent growth in 2018. The tax cuts package will only accelerate that advancement. In fact, we are already seeing some positive results in the state. Arizona-based YAM Worldwide announced it will be giving out $1.3 million in bonuses to its employees. Furthermore, over 1,000 JPMorgan Chase employees in Arizona will receive wage hikes or bonuses as part of the companies nationwide $20 billion, five-year plan to invest back into the country. In addition, a report from the nonpartisan Tax Foundation found the bill will create almost 6,500 jobs in the state. These must be the “crumbs” Nancy Pelosi and the Democrats scoffed at while trying to explain away the benefits resulting from tax relief. For some, these “crumbs” represent eased rent worries, the ability to afford childcare or help with the skyrocketing costs of healthcare. The examples chronicled above are only a small piece of the benefits the tax bill has induced. Imagine the impacts Arizona will feel a year from now. Washington, DC (January 4) – Today, Congressman Andy Biggs (AZ-05) announced that he had submitted two amendments to the Regulations from the Executive in Need of Scrutiny Act of 2017 (REINS Act). The REINS Act seeks to restore oversight authority to Congress for any major federal regulation that could potentially cost the U.S. economy at least $100 million. Congressman Biggs also testified in front of the House Rules Committee on behalf of his two amendments this afternoon. Watch Congressman Biggs’ testimony in front of the Rules Committee. Amendment #5: Lowers the annual economic effect threshold for a major rule from $100,000,000 to $50,000,000. Congressman Andy Biggs is a first-term Representative from Arizona’s Fifth Congressional District, representing parts of Chandler, Gilbert, Mesa, Sun Lakes, and Queen Creek. He lives with his wife Cindy in Gilbert. Farrell Quinlan, Arizona state director for the National Federation of Independent Business, issued the following statement this afternoon on the release of Gov. Doug Ducey’s proposed state budget. 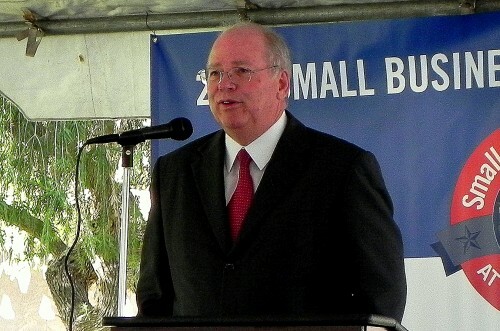 “Arizona small-business owners appreciate the courage and care Gov. Doug Ducey has shown in crafting his bold balanced budget plan. It’s refreshing that we have a governor willing to make the tough decisions that reflect the priorities of regular Arizonans rather than special interests. “Governor Ducey’s plan eliminates the current budget deficit and re-establishes a structurally-balanced budget by Fiscal Year 2016-2017. And he accomplishes this seemingly impossible goal with no tax increases while also sustaining classroom spending. Amazing. “Governor Ducey has rejected bogus budgeting that looks balanced in the hazy florescence of bureaucratic custom only to be revealed in the sunlight as being written in red ink. He has made the kind of tough choices that most small-business owners had to make during the Great Recession in order to survive, including a hiring freeze, reducing administrative expenses and consolidating operations. With 350,000 dues-paying members nationwide, including more than 6,000 in Arizona, the National Federation of Independent Business is America’s largest and leading small-business association. “Arizona small business owners are thrilled and inspired by Governor Doug Ducey’s bold initiative to make Arizona the best place in America to work and do business. “Governor Ducey’s new regulatory moratorium and top-to-bottom review of regulations throughout state government are exactly what an all-too-often beleaguered small business community has been counting on him to pursue and deliver. “In his State of the State Address today, Governor Ducey again demonstrated that he grasps how burdensome and job-killing over-regulation can be for small business’ ability to survive, let alone grow and prosper. Adding a small business owner to his Regulatory Review Council will help ensure his commitment to reducing timeframes for permits and licenses are accomplished. “Small business owners work very hard to comply with the mountain of regulations federal, state and local jurisdictions impose on them. It’s spectacular to hear Governor Ducey commit to eliminating bureaucratic entanglements that are outdated, irrational, unfair or destructive to free and honest enterprise in Arizona. 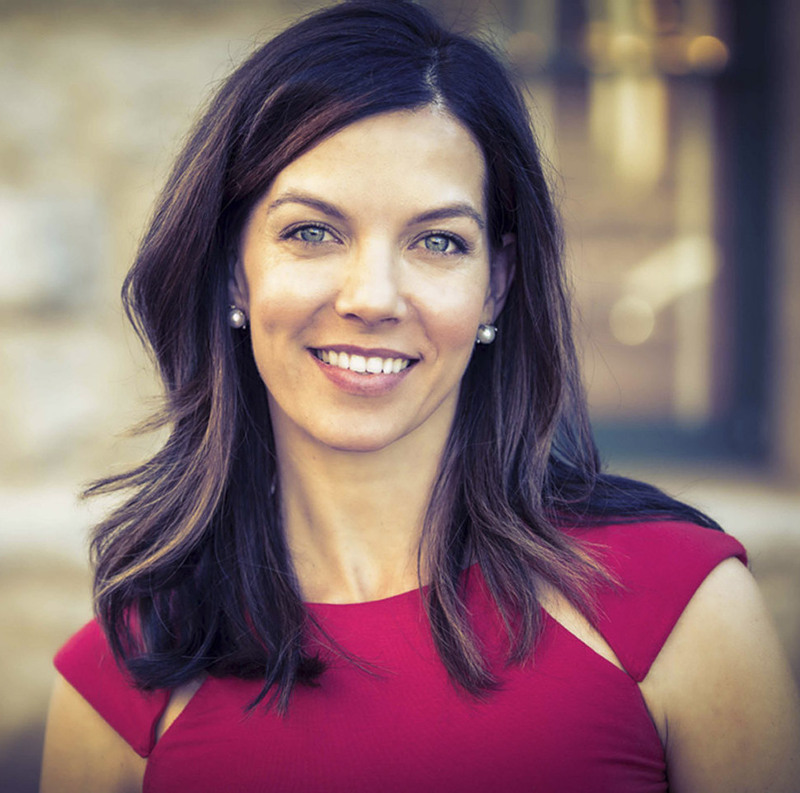 The political action arm for America’s voice of small business today announced its endorsement of entrepreneur and pioneer Wendy Rogers for Congress over incumbent Kyrsten Sinema. “Wendy Rogers knows first-hand the rewards of building a successful enterprise, the duty of making payroll, the challenge of government regulatory compliance and the profound responsibility for the economic fates of as many as 100 employees and independent contractors affiliated with her small business,” said Farrell Quinlan, Arizona state director for the National Federation of Independent Business. 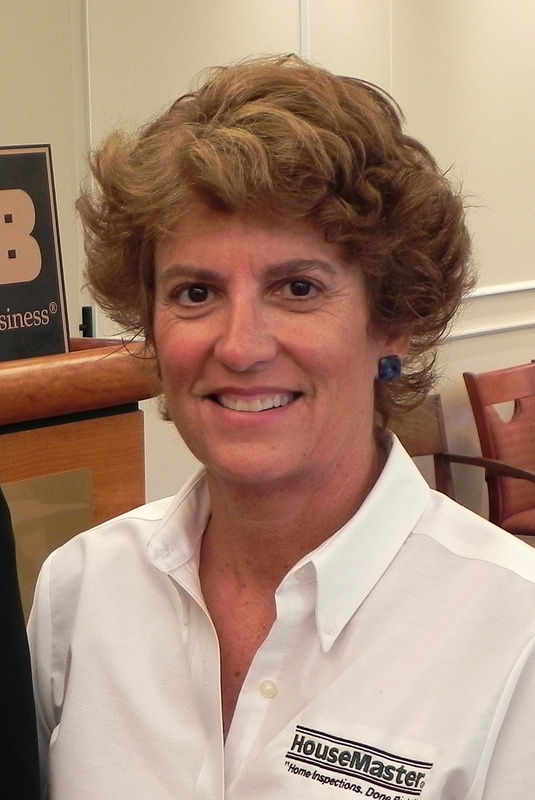 Rogers is the owner of a home inspection business, and is an NFIB member. The endorsement of Rogers (9th District) was made by NFIB’s SAFE (Save America’s Free Enterprise) Trust, the association’s political action committee. NFIB has 350,000 dues-paying members across the nation, including 7,000 in Arizona. Brief, single-pages of bulleted information on the power of the small-business vote, what a small business is and the distinctions it has from a big business can be found here. Calling his eight years in the Legislature “the high-water mark for pro-small-business policy advances,” the nation’s largest and leading small-business association today endorsed Andy Tobin for Congress over incumbent Ann Kirkpatrick. During Tobin’s eight years in the Arizona House, he earned a 96 percent voting record with NFIB, siding with Main Street job creators on 43 of 45 issues. 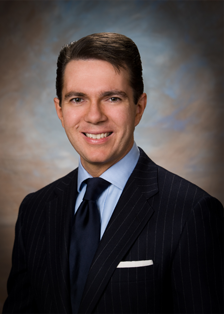 The endorsement of Tobin (1st District) was made by NFIB’s SAFE (Save America’s Free Enterprise) Trust, the association’s political action committee. NFIB has 350,000 dues-paying members across the nation, including 7,000 in Arizona. Arizona Second Congressional District Republican nominee Martha McSally meets with small business owners this week in Sierra Vista where NFIB’s Farrell Quinlan announced the small business organization’s endorsement of McSally’s campaign for Congress. Claiming he has abandoned his small-business roots, America’s largest and leading small-business association today endorsed challenger Martha McSally for Congress over incumbent Ron Barber. The endorsement of McSally (2nd District) was made by NFIB’s SAFE (Save America’s Free Enterprise) Trust, the association’s political action committee, and based on interviews and answers to a questionnaire. NFIB has 350,000 dues-paying members across the nation, including 7,000 in Arizona and 1,149 in the Second Congressional District. 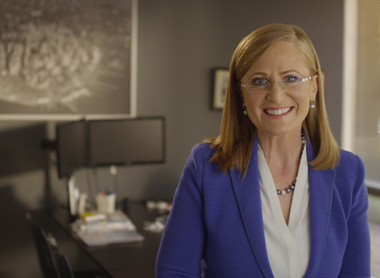 In addition to today’s endorsement, NFIB launched a digital ad campaign urging voters to support Martha McSally, as well as a House candidate webpage on its National Election Center website. Voters can find tools on the website that make it easy to volunteer, donate and support Martha McSally. The effort is part of the NFIB’s Vote for Main Street campaign. 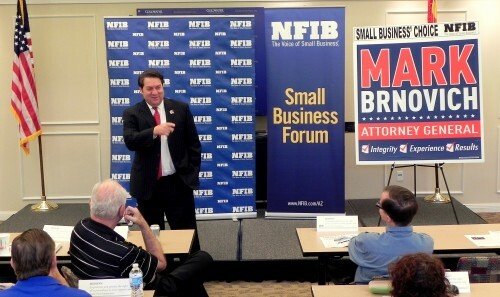 PHOENIX, Ariz., Sept. 10, 2014 – Appreciating that the state’s attorney general is our last line of defense against the overreach of an aggressive federal government, Arizona’s leading small-business association today announced its endorsement of Mark Brnovich for Arizona’s next attorney general. This poll of 379 Arizona small-business owners was conducted by NFIB/Arizona between August 28 and September 4, 2014. The Brnovich endorsement is the 7,000-Arizona-member-strong, small-business advocacy group’s first endorsement in the attorney general’s race in more than a decade. The decision to endorse was largely driven by the results of a survey of small-business owners that revealed a decisive favorite. In that survey, former federal prosecutor and ex-Gaming Department chief Mark Brnovich received 89 percent support to former top state banking regulator Felecia Rotellini’s 11 percent in the poll of 379 Arizona small-business owners conducted by NFIB August 28 to September 4, 2014. “As Arizona’s next attorney general, Mark Brnovich will provide solid legal advice to state regulatory agencies in order to prevent overreach, regulatory bullying of small-business owners and to ensure state agencies aren’t acting on bad or inaccurate legal advice,” Quinlan said. The formal endorsement of Mark Brnovich was made by the NFIB/Arizona Save America’s Free Enterprise (SAFE) Trust, the political action committee of NFIB members in Arizona. 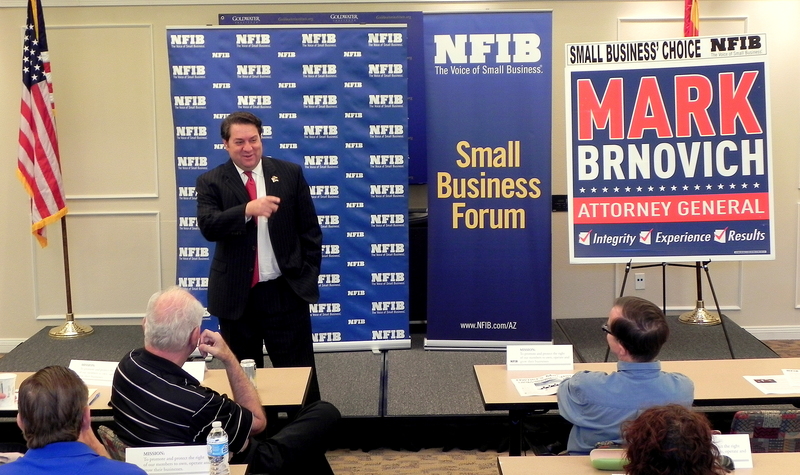 Republican Attorney General nominee Mark Brnovich discusses small business issues today at the NFIB/Arizona Small Business Forum in Phoenix. 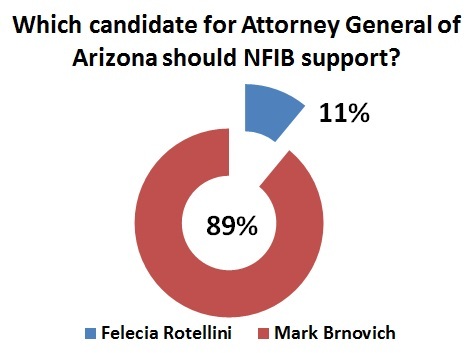 Earlier in the day NFIB/Arizona announced its endorsement of Brnovich and reported that 89% of small business owners polled supported the election of the former federal prosecutor.